Keeping hands clean is one of the most important ways to prevent the spread of infection and illness. Hand hygiene is a simple thing and it's the best way to prevent infection and illness. Clean hands prevent infections. Keeping hands clean prevents illness at home, at school, and at work. Hand hygiene practices are key prevention measures in healthcare settings, in daycare facilities, in schools and public institutions, and for the safety of our food. In healthcare settings, hand hygiene can prevent potentially fatal infections from spreading from patient to patient and from patient to healthcare worker and vice-versa. On May 5, World Hand Hygiene Day is celebrated by the World Health Organization (WHO), CDC and other partners to encourage healthcare providers to promote and practice good hand hygiene measures to reduce the risk of infection among patients. CDC has developed several hand hygiene resources for patients and healthcare providers. To download the video and accompanying brochures and posters in English and Spanish, please visit Hand Hygiene in Healthcare Settings. CDC partnered with the Association for Professionals in Infection Control and Epidemiology and Safe Care Campaign to develop and launch a hand hygiene video for patients and visitors in hospitals. The video teaches patients about the importance of practicing hand hygiene while in the hospital to help prevent infections. The video also seeks to empower patients by providing strategies they can use when asking their healthcare providers to practice hand hygiene. Modeled after the video that airline passengers are required to view prior to take-off on a flight, this new video is intended to be shown to patients upon admission to the hospital. The goal is to inform patients at the beginning of their hospital stay about what they can do to help prevent infections throughout the duration of their stay. 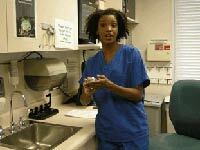 The 5-minute video begins with a brief introduction on healthcare-associated infections. It is then narrated by a nurse character named Gayle who stresses the importance of hand hygiene for both patients and healthcare providers. There are two patient room scenes in which patients and visitors model the behavior of asking one another as well as their healthcare providers to perform hand hygiene – with positive results. Patients and visitors should take an active role and become involved in their healthcare by practicing and encouraging others to practice hand hygiene during their hospital stay. This online training course reviews the key concepts of hand hygiene and other standard precautions to prevent healthcare-associated infections. It is intended for healthcare providers and includes a self-paced navigation program that allows users to learn through both text and image-based pages. The course also includes several interactive activities and questions, which reemphasize the learning objectives throughout. A unique close-captioned 60-second video demonstrates the appropriate technique for handwashing mid-way through the course. At the conclusion of the course there are creative posters and screen savers available for download. The training course is available at Hand Hygiene in Healthcare Settings.